HarmonicScore.com is a web-based visualization tool for understanding the overtonal harmonic interactions of music in different tuning systems (Equal Temperament, Just Intonation in various keys, etc.). Built for Boston Music Hack Day 2012 with Russell McClellan, it is optimized for Chrome and is in beta. The input is a MIDI file that can be rendered using a variety of tuning systems, multiple color schemes to highlight different attributes, and secondary analysis of perceptually prominent overtonal interactions. The hope is that this tool will give greater insight into how composers' personal style is exhibited in voicing and tuning system. One of the projects that inspired HarmonicScore is the Music Animation Machine. HarmonicScore builds on the idea of the Music Animation Machine by adding visualization of harmonic components and control of the tuning system. Equal Temperament and Just Intonation in 12 keys are the current options. Below you can see a video from the Music Animation Machine visualizing Bach's Aria from the Goldberg Variations. This is the piece that HarmonicScore loads with by default. Watch at least the first 3 bars of this Music Animation Machine Aria visualization so that you have a baseline with which to understand what HarmonicScore adds to this concept for theoretic insight. What are the important perceptual features of the harmonic statement? How would this harmonic effect differ if the piece were played in Equal Temperament versus Just Intonation? HarmonicScore seeks to provide insight into these questions. 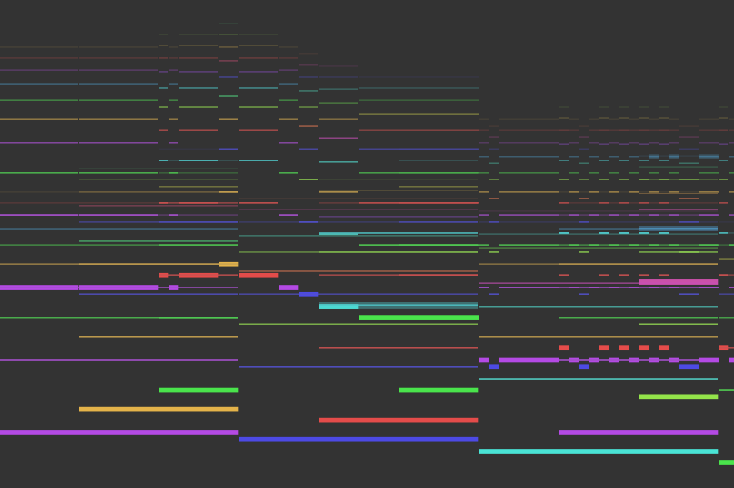 Below are the first 3 bars of the same Aria using 2 different HarmonicScore visualizations: Equal Temperament (left) and Just Intonation G (right). From a high level, there are at least 2 notable differences highlighted by the perceptual analysis. In bar 1, beats 2-3, the Equal Tempered version has detected perceptual beating and highlighted it: the transparent yellow. In bar 2, beats 2-3, the Just Intonation G version has detected perceptual beating and highlighted it: the transparent green. Below, you see the exact same views but with pitch class coloration removed. The transparent perceptual beating sometimes is more apparent in this mode. Are there core attributes of a composer's musical language that become clear analyzing music this way? Can you quantify perceptual differences between different tuning systems? HarmonicScore is a first step toward a quantitative analysis of these nuances that connect auditory perception to unique compositional style and a deeper understanding of harmony and tuning systems.